MAFS contestant responds to viral Jessika Power drink driving video. Jessika Power says claims she was drink driving in a leaked video are false. In an Instagram story yesterday, she explains that she wasn’t intoxicated, but had had two glasses of wine. 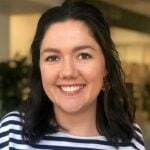 “I have felt such an overwhelming need to apologise about the video that aired on Channel 9 last night that has been taken out of context, had I been asked for my comment before it airing I would have been more forthcoming in this statement,” she began. 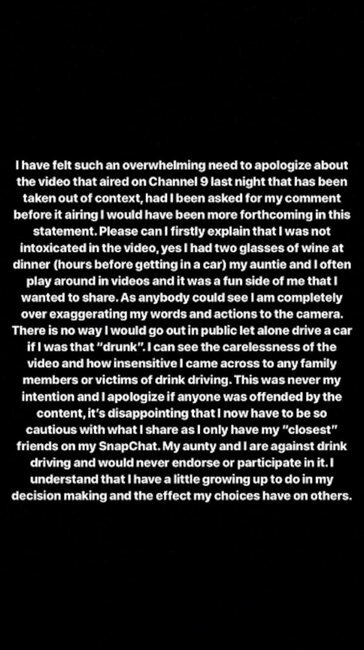 “Please can I firstly explain that I was not intoxicated in the video, yes I had two glasses of wine at dinner (hours before getting in a car) my auntie and I often play around in videos and it was a fun side of me that I wanted to share,” she added. In the statement, she says that was not actually drunk, but exaggerating. “As anybody could see I am completely over exaggerating my words and actions to the camera. There is no way I would go out in public let alone drive a car if I was that “drunk”,” she said. “I can see the carelessness of the video and how insensitive I came across to any family members or victims of drink driving. This was never my intention and I apologise if anyone was offended by the the content, ” she added. She finished off by saying she was disappointed that it had been leaked, but that she understands she has some growing up to do. "It&apos;s disappointing that I now have to be so cautious with what I share as I only have my closest friends on SnapChat. My aunty and I are against drink driving and would never endorse or participate in it. I understand that I have a little growing up to do in my decision making and the effect my choices have on others," she said. The self-filmed Snapchat video contained footage of the former Married at First Sight 2019 star driving with who she says is her aunt. "Uncle Riley is right next door to us and if he knew that we were going to drink and drive and get cigarettes we&apos;d be in that much trouble," she says, filming herself laughing behind the wheel. "Ah sh*t I&apos;m in the middle of the road," she screams. 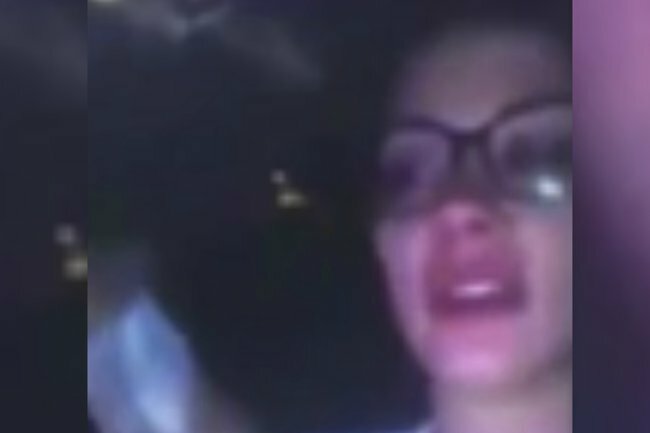 The passenger then yells at Jessika, telling her "I am responsible now put your phone down." The video follows the pair as Jessika gets to the bottle shop, only to find it is closed. "BWS is shut, this is it, this is the end of the line," she says, before returning to her car. "Where am I turning?" she asks her passenger, who tells her to stop using her phone in case police see her using it. Mamamia reached out to Jessika Power for comment and she sent through the same Instagram statement.